Conflict was written in the 1990s, while game genres were still fluid and expectations for graphics were still relatively modest. A team of two or three people could quite reasonably produce a game. I was lucky enough to start working with my friend and colleague Shahid Ahmad, who was already an established professional developer. The PC version can be downloaded from abandonware sites. I had always been fascinated by strategy games, and I remember being impressed by Chis Crawford’s "Balance of Powers". This proved that a game could combine politics and strategy. But I wanted something that didn't treat other countries purely as statistics. I had little useful knowledge of assembly language, but Shahid wrote a small graphics library for me and guided me towards the relatively new 'C' language. The early success of the software games industry ensured the interest of big business and the decline of small scale development. So Conflict is both a product of the period, and probably irreproducible in a modern commercial environment. "Why the Middle East? And why Israel?" 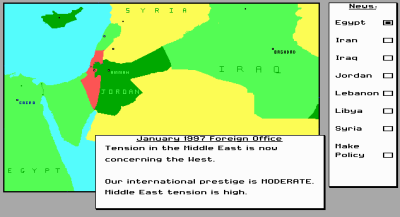 As now, the Middle East was in the news throughout the eighties, so it was a familiar battleground. Israel represents a classic dilemma of principles vs. survival. Today, attitudes towards Israel are far more extreme than they were. Yes, the game is politically incorrect at times; not necessarily at the expense of nations in the Middle East however. "Why can you not play as other countries like Syria or Iraq?" The extra work would have made the engine more generic, and a little harder to focus on the other strands of the game e.g. the Palestinian problem. I wasn't keen on players viewing nations in the region as being somehow "interchangeable". "What about open source development"
"Is there a fix for the crash bug?" There does seem to be a bug which crashed the game depending on how things develop. Unfortunately I know of no way around this and I don't have the code. Try the abandoware sites. "Will you write Conflict 2?" I may get a period where I can revisit Conflict, I really can't say. Even as I write this, I'm watching a BBC news report on Israel’s latest incursion into Lebanon. My last idea after Floor 13 was "International global terrorist". As you can imagine, the post 9/11 political climate made this a stunningly bad idea.